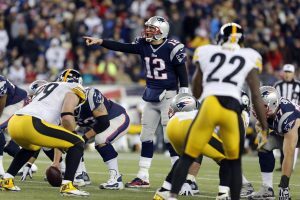 The leader in the AFC East the New England Patriots will travel to Pittsburgh to face the leader of the AFC North the Steelers at Heinz Field this Sunday at 4:25 pm ET. A much anticipated matchup, that promised to pin two powerhouses against one another, has taken a downturn with the announcement that Steelers quarterback Ben Roethlisberger will be out of the game for at least 4 weeks and possibly 6 since undergoing knee surgery to repair his meniscus. Landry Jones is expected to take fill in for Roethlisberger; despite this being Jones’ fourth season this will only be the third start of his career and he has not wowed anyone in any of those games. Landry has a pass completion rating of 76.0 with 56 pass attempts and a completion percentage of 57.1, three touchdowns and four interceptions. When this match was first announced, the Steelers actually had a slight advantage, however after their loss to the Dolphins last week and now with Big Ben out, the tables have turned. The Patriots are now laying 7 at AceSportsbook.com and considering how important Big Ben is to the team that seems like a bargain. The Patriots have been unstoppable since the return of Brady, and with Ben out of the picture there is little chance the Steelers will put a damper on their winning streak. So to help make this game as interesting as it was a couple of weeks ago, I propose a few prop bets. Landry Jones will finish the game with 4 interceptions, I might even go as far as saying he will throw an interception in every quarter of the game. The Patriots will put so much pressure on him he won’t be able to help himself. Le’Veon Bell will have a huge game with at least 150 yards. Bell has racked up 440 yards in three games, with Roethlisberger out he will need to keep this pace and possibly improve it to help the Steelers survive. Tom Brady will throw for more than 300 yards in this game and three touchdowns. Brady has been on fire, having played in only two games he already has accumulated 782 passing yards, this week should be no different. Julien Edelman will break the 100-yard mark in this game. Since the return of Gronkowski and Bennett, Edelman was somewhat sidelined, but in this game I think he will break through and find himself in some pretty awesome matchups with the Steelers corner backs, Brady will pass him the ball and the rest will be history. The total in the game will go over. The NFL betting line for the total is at 47, I predict the final score of the game will be 38-17. It is a shame this game won’t be as evenly matched as we had hoped, none the less this will be the first winning team that Brady faces this season and the Steelers are not about to go down without a fight. I look forward to seeing Le’Veon Bell and Antonio Brown step up and possibly become heroes for their team. They won’t be able to win against the Patriots but they should hold up against weaker teams.